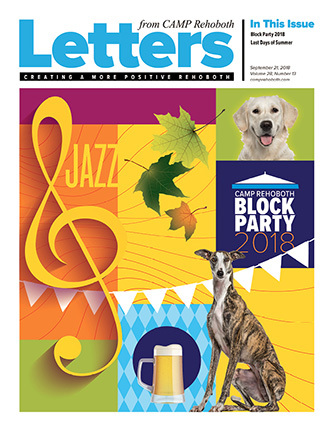 Contributing to this issue: Murray Archibald, Sondra N. Arkin, Rich Barnett, Tony Burns, William Chasanov, Wesley Combs, Stefani Deoul, Michael Thomas Ford, David Garrett, Michael Gilles, Fay Jacobs, Lee Lynch, Tricia Massella, Monica Parr, Eric C. Peterson, Mary Beth Ramsey, Richard Rosendall, Terri Schlichenmeyer, James Adams Smith, Eric W. Wahl, Debbie Woods, Doug Yetter. On the cover: Block by Block, cover design by Mary Beth Ramsey. September 21, 2018 - Block Party 2018! September 21, 2018 - CAMP Cheers!